Thomas William Pulliam, age 94, of Madison, NC, passed away Sunday, March 17, 2019. He was born in Ridgeway, Virginia to the late Roy Pulliam and Brooksie Watkins Pulliam. In addition to his parents, he was preceded in death by his wife, Josephine Nickens Pulliam; daughter, Lisa Jo Pulliam; brothers, Drewey Pulliam, Johnny Pulliam, Billy Pulliam and Charlie Pulliam; sisters, Gaynell Land, Ann Whitley, Daisy Collins, Mae Knowles and Ada McGlamy. 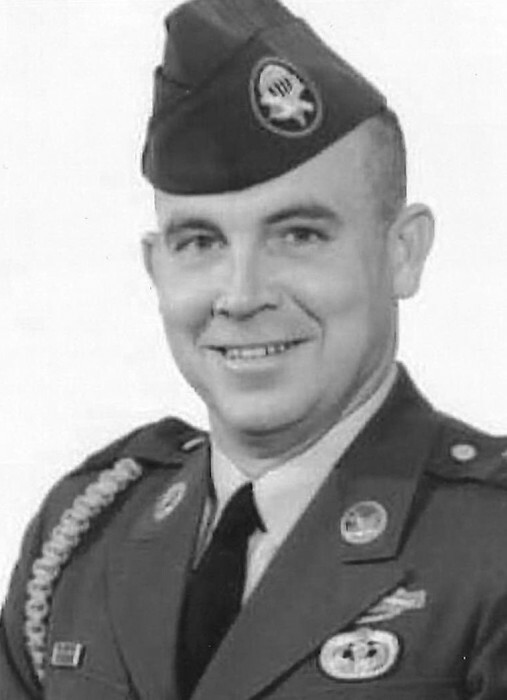 Tom served his country for 27 years in the US Army with tours of duty which included World War II, Korean War and Vietnam War. Command Sergeant Major Thomas Pulliam of the 501st, 504th, 511th, 327th, 187th, 101st, and 82nd company served a long, distinguished career in the United States Army. Throughout his years of service, Tom received many accolades and honors, such as the World War II Bronze Star and Purple Heart, WWII Victory Medal, American Theater Campaign Medal, Army of Occupation Medal, Army Good Conduct, Army Commendation Medal, Airborne Paratroopers Wings, Army Senior Jump Wings, Jumpmaster Wings, Korean Bronze Star and Purple Heart, Vietnam Bronze Star and Purple Heart, Airborne Regimental, Korean War Service Medal, United Nations Korean Service, Korean Defense Service Medal, Korean War Service Medal, Vietnam Campaign Medal, Vietnam War Medal and Ribbon, and Vietnam Service Medal and Ribbon. Tom was a proud Paratrooper and loved to share his experiences with anyone willing to listen. It was his courage, dedication, and passion for our country that made Tom a paramount member of America’s Greatest Generation. Additionally, Tom was grievously wounded in battle during the Vietnam War, losing an eye and suffering a serious leg wound. Despite his injuries during battle, Tom continued to engage in hand to hand combat with one of the enemy soldiers. During this fight, Tom lost his jungle fatigue jacket, which held in its pocket his gold Gruen watch. Amazingly, thirty-three years later and long into his retirement, Tom’s watch was returned to him at an award ceremony in Campbell, KY. The ceremony was to honor the men of the 2nd 327th with a Presidential Unit Citation for the Battle of Trung Luong. Unknownst to Tom, Sp4 Anthony Burgee of Bravo’s third platoon had long ago recovered his watch on the battlefield, shortly after Tom had lost it. It was there at the award ceremony in Kentucky that Burgee was happy to return Tom’s lost watch to its rightful owner. Surviving relatives include one brother, Donald Pulliam and wife, Yvonne of Mayodan; two sisters, Ellene Manuel of Mayodan and Shirley Boles and husband, Winford of Mayodan. The family will receive friends on Wednesday, March 20, 2019 from 2:00 PM to 3:00 PM at Bridges-Cameron Funeral Home. The graveside service will follow at 3:00 PM at Jonesboro Cemetery with Keith Knight officiating.